The life cycle of a call using AMD is below. The user experience for a recipient of a call using AMD is impacted if there is a delay from the time they pick up the phone to the first packet of audio they hear. Twilio has optimized our AMD system to quickly classify calls, it is important to also optimize your application to respond quickly to TwiML requests. 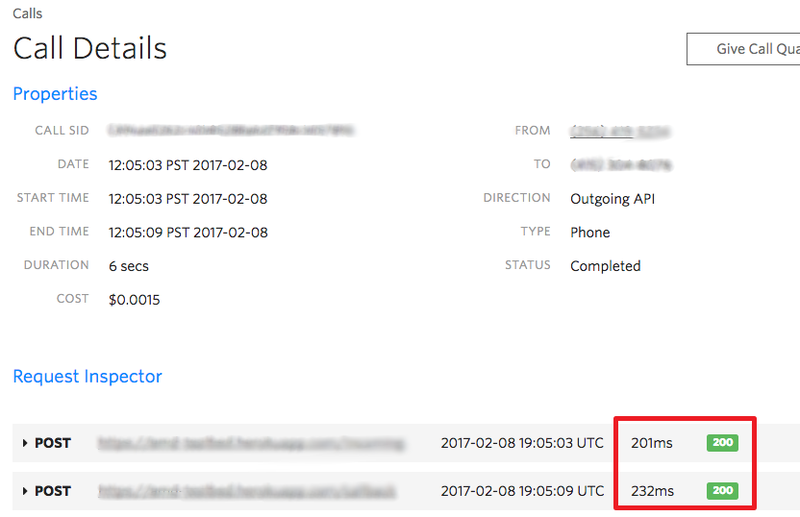 To minimize delay, ensure you benchmark your application to ensure that webhooks from Twilio are processed and responded in a timely manner. In test applications running in EC2 we can get this time under 150ms, TwiML served from TwiMLBins can come in under 100ms. If you are using Play verbs we recommend hosting your media in AWS S3 in US East 1. No matter where you host your media files, ensure that you're setting appropriate Cache Control headers. Twilio uses a caching proxy in its webhook pipeline and will cache media files that have cache headers. Serving media out of Twilio's cache can take 10ms or less, keep in mind that we run a fleet of caching proxies so it may take 10 or so requests before all of the proxies have a copy of your file in cache. To help you benchmark your server's response time to Twilio, we expose the request duration in milliseconds for every request in the request inspector. You can view these clicking into the call detail page in the console.